Many people have written about the state election result. I thought I’d add my two-cents worth… noting that as of Wednesday night, some seats are still in doubt. The Coalition crime fear campaign didn’t resonate. The stats don’t match the rhetoric, and while the accounts from actual victims could be harrowing, Melbourne is not a crime-infested cesspit. That’s no comfort to those who have been victims of of course, and more can be done to combat crime, but this is not an unsafe city. Anecdata is only convincing (eg reflective of reality) if enough people are directly affected. How many people do you know who have been the victim of a violent crime? I thought the rhetoric, especially when the Coalition got to the point of declaring that anybody who committed any offence while on bail would be locked up, over-the-top. The anti-Skyrail campaign didn’t resonate. People living underneath it might dislike it (though not all do) – but ultimately the broader community didn’t hate it. All the seats with skyrail in them now (Caulfield, Oakleigh, Mulgrave, Keysborough) and getting skyrail (Bass, Carrum) swung towards the government, not away from it. Perhaps that was helped by the fact that skyrail exists now. It’s real. Perhaps it’s not pretty, but it’s not covered in graffiti or filled with drug dealers as some claimed it would be. From where I was sitting, the Coalition had few prominent, positive policies. They took a back seat to the negative campaigning. Their best (in my book) policy was announced and then quietly dropped: trains every 10 minutes. What a shame. Their decentralisation policies seemed a good idea at a high level, though the fast rail pledges looked undercooked, and some of the detail around the rest of it either wasn’t thought out in detail, or wasn’t communicated well. The ridiculous intersection grade separation plan didn’t resonate. Plenty of people drive absolutely everywhere, but I don’t think many of them thought this was a good idea. The campaign didn’t work. The policies didn’t work. The organisation, the administration didn’t work, the leadership didn’t work. We didn’t have any cut through. Across the board it didn’t work. 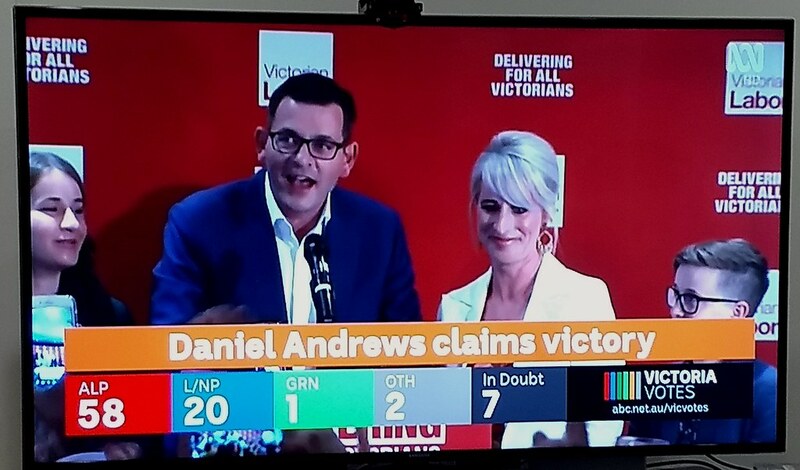 Big swings to Labor, putting normally safe Liberal seats like Hawthorn and Brighton at risk showed that even though people live in wealthy suburbs, it doesn’t mean they’re dinosaurs, and they were clearly not keen on the crime narrative, nor the Liberal party being dragged to the right by the likes of Dutton and Abbott. Meanwhile, Labor’s narrative of “a positive and optimistic agenda” (this literally became their catchcry) was perhaps clichéd, but also justified by some big achievements in just four years. Who’d have believed they’d get 29 level crossings removed? It meant many people overlooked their failings such as the redshirts affair. So now we have four more years of Labor. More level crossing removals – which is good. And thanks to the benefits of incumbency, plans for rail upgrades that are arguably more logical than the Coalition’s ambitious (perhaps impossible) pledges for high speed rail. Labor will borrow more money to pay for infrastructure. I remember being at a transport breakfast thing years ago with some bigwigs who were saying it was ridiculous that governments have such a fear of borrowing. You borrow to buy your house, and it costs money, but it’s good. Why not borrow to invest in infrastructure that grows the economy? I don’t have a major problem with this, though the question is: are the specific big projects they’re borrowing for actually worth the money? North East Link, for example – Infrastructure Victoria gave it the thumbs up in 2016 based on a cost of $5-10 billion, but a Business Case released early in 2018 appeared to inflate the benefits. Speaking of business cases and infrastructure, the Suburban Rail Loop doesn’t yet have a business case. If the project happens, it may be decades away. But it caught the imagination of the populace, and I’m told the ALP reckon they saw bigger swings in the electorates nearby. In the meantime, what about Metro 2, which by any logic is a higher priority to ensure Fishermans Bend is a success and the Werribee and Mernda rail lines cope with growth. And right here and now, there has to be a commitment to upping all-day service levels on the existing infrastructure. Melbourne is growing fast, and we can’t wait for the Metro tunnel to open in 2025 to see more trains running. Let’s hope the newly re-elected government realises that it’s not just infrastructure that’s important — how you use it is vital. Update Thursday lunchtime: The Premier has announced a reshuffle. The new Public Transport Minister is Melissa Horne. Jacinta Allan picks up Transport Infrastructure. Roads Minister is Jaala Pulford. Daniel, a well balanced and comprehensive assessment. Thanks. As a Sandy line traveller, a train every ten minutes at night and weekends would be awesome. I won’t hold my breath. PS As a Brighton voter, I don’t mind being labelled a dinosaur, since these mammals ruled the earth for longer than human-kind is likely to! My understanding on trains-every-10-minutes is that while it could be rolled out in 12 months, it would almost certainly lead to a dramatic reduction in service quality (in terms of on-time running and cancellations). No government wants to take responsibility for presiding over that, so it’s better to chip away at the problems on the network, such as the single track sections, lack of rolling stock, track maintenance backlogs, etc. and gradually transition toward 10 minute frequencies in a more sustainable manner. I agree that we can’t wait until 2025 to start running more services, so hopefully we do start to see more 10-minute and 15-minute frequencies gradually introduced over the next 4 years, but a system-wide roll-out in the short term is not practical. Labor has said they expected to start building SRL from both ends (Airport rail and Cheltenham – Box Hill) by 2022. So this is not really a “if it happens it may be decades away” thing, if the government’s track record in delivering on their promises is anything to go by. Is it a lower priority than MM2 ‘by any logic’? Only if you think having a suburban rail network is not a priority. The radial system is not fulfilling our needs adequately and the SRL will help spread demand more evenly across the network meaning that it’s not purely focused on the CBD. Ultimately we will need both. The government has shown that they can walk and chew gum at the same time, so while MM2 may be put off by a few years, there’s no reason SRL and MM2 can’t be built simultaneously. Yes, MM2 is needed to ensure Fishermans Bend is a success in the long term, but two tram lines, a good bus network and cycling network will suffice in the early years. In the meantime, there’s plenty of other parts of Melbourne which need the better rail access that SRL will bring too. I also think that SRL will force the government into improving the connecting bus networks in the area it services to make sure the project is a success, and that’s a great thing. As always, a good analysis – thanks Daniel. Surely the lowest of the low-hanging fruit here are the bus and tram networks. Reorganising bus routes so they’re more frequent and less serpentine, as well as giving trams road priority and building minor extensions, would be of far greater immediate benefit than the suburban rail loop. The Liberals didn’t have much to say about trams and buses, either. Is there anything substantial in the works on these fronts? 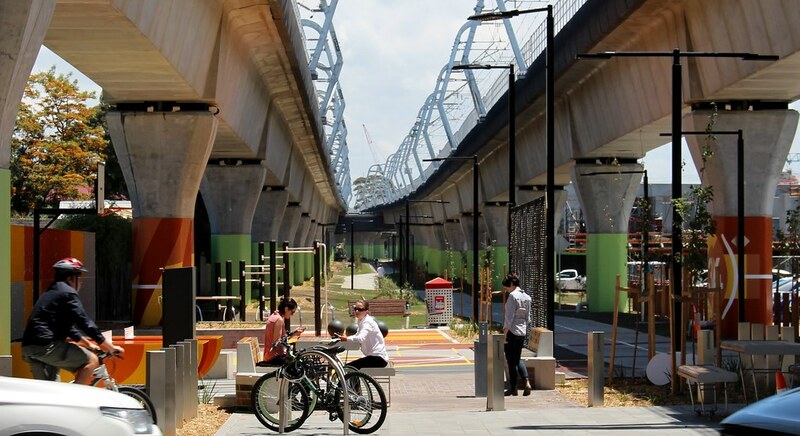 The suburban rail loop doesn’t have to make economic sense all right now, all at once. It can be staged. It might make sense to run the Box Hill – Doncaster – Heidelberg and Cheltenham – Monash sections first, while the Airport Rail connection is being built on the other side. It will be a challenge to get them to focus on frequency and accessibility, which will involve buying new rolling stock and retiring ancient trams, and making frequency a political priority. I don’t hold out much hope of any improvements to walking and cycling in Melbourne, despite these modes being virtually free in comparison to all others the Government invests in. A more frequent service in the intra-peak would definitely be beneficial. The Frankston line gets a ten minute frequency. I wish we could get the same level of service on the Werribee. I also wonder if there’ll be 25 more level crossings promised at the next election on top of the 75 we have been promised now. Also I am really excited for the SRL and hope it goes down the path. It remind me back of when I lived in Singapore in the 90s and early 2000s and the promise of additional rail lines. If trains are running every ten minutes it probably doesn’t matter too much if they’re running late – however cancellations are another matter. It would also make sense to have regularity at the junction stations – it does exist but not at all times. Extending trams to logical interchange points or final destinations makes sense – although of course that requires capital expenditure that’s not needed in fixing up issues with bus routes. Reminds me a little of how the tram line extends a couple of hundred metres along Footscray Rd at Docklands, with no apparent purpose! Gives a slight headstart on the tram to Footscray, I guess! Building the bits of SRL first that would extend the radial network, such as Doncaster to Box Hill, would make sense to me as an alternative to Doncaster rail in the first instance. But it would need good quality and minimal time interchanges at Box Hill. More generally, the number of people who have to interchange to get to their final destination will only increase with Metro 1, as city commuters on the Sunbury/Dandenong corridor will need to interchange for Parliament, Flagstaff and Southern Cross, and for some other journeys that can currently be done directly. BTW it looks like work on the third platform at West Footscray is about to kick off – hopefully means more trains stopping there! On buses, is there a clear rationale for what each bus route is trying to achieve? Or is it more that some routes are trying to achieve multiple outcomes simultaneously but badly? However, there is one thing that has grated at me since the first ‘skyrail’ was promoted. The word ‘skyrail’ – it’s so obviously a confection thought up by a public relations guru to provide positive spin on a potentially unpopular proposal. There is a perfectly good word that has been in use for over 150 words to describe the concept – viaduct. Anyone ever heard of a railway viaduct? I think I’m turning into a curmudgeon who gripes about the decay of the English language. @Russell – As best I can tell the term was invented by the Herald Sun seeking to jazz up the story, and it stuck.